If you are here for the Hahnemühle YouTangle.Art tiles giveaway, go here. One of the few downsides to being one of the first to get new products is that sometimes the information isn’t all available yet. The Sarasa Fineliner color chart has not been posted, so I’m not able to match the names to the colors and be sure of the accuracy. Blue, Dark Blue, Electric Blue, Sky Blue, Fluorescent Green, Spring Green, Green. The colors in this scan don’t look true on my screen, especially the fluorescents. They do seem more accurate in my drawings though. The 24 pack doesn’t seem to be available yet, but individual pens can currently be purchased for USD $1.75 per pen at the Zebra pen site. The Sarasa Fineliner is a one of those writing/drawing instruments that as much a marker as it is a pen. The fiber tip and bright, intense colors make it seem more like a marker. But the needle-point and metal-enforced tip are more pen-like. The body is a light but sturdy plastic. The clip is a different kind of flexible plastic that can be lifted out just enough to allow you to secure the pen in a pocket or on a folder. I’m one of those people that sit and flip that kind of clip back and forth until it breaks – none of them have yet, but we’ll see. The cap, the clip and decorative swirls indicate the color of the ink but, of course, the match is not perfect. I’ve had a little trouble figuring out the purples and pinks, but figured out the other colors with no problem. Other than the swirls, and the words Sarasa Porous Pen, the body of the pen is black with the words Sarasa Porous Pen printed on it. Sorry for the lack of focus on these two photos. As I went to download the photos I took, I discovered that neither my laptop or desktop would recognize the USB device. So, my camera’s still taking photos, but I can’t download them. Hoping it’s the USB and not the camera! The metal reinforcement means the fiber tip will hold up longer even for those with a heavy hand. It also helps when you are using a ruler to draw a straight line. I found the pens very comfortable in my hand, even after hours of drawing. Because the nib is so small, it takes a while to cover larger areas. 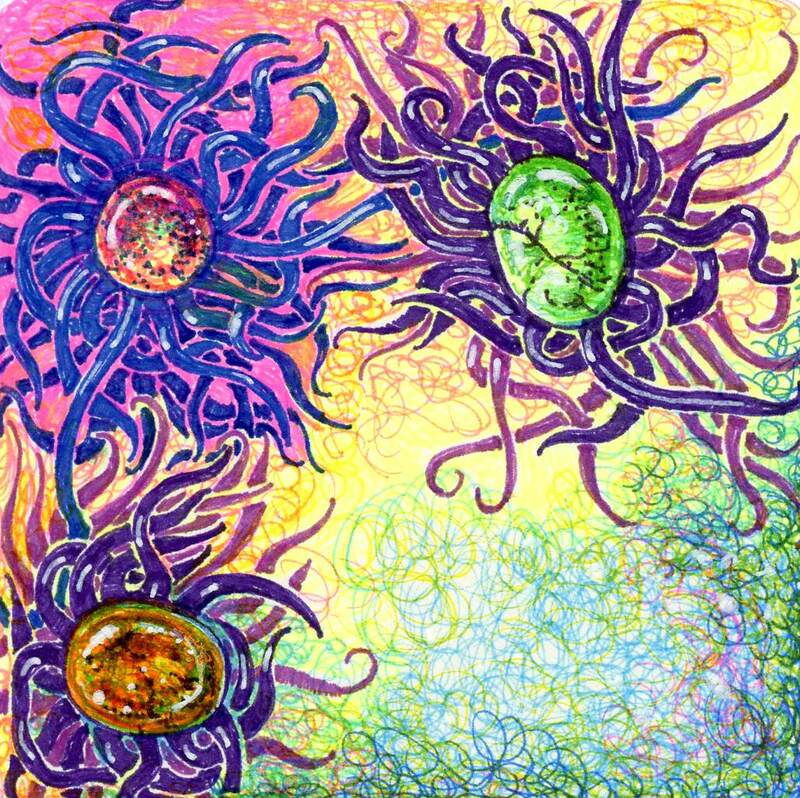 I did a lot of squirkling, which is, in essence, scribbling in circles, adding layers of different colors. It’s a very nice method for blending, but it is time consuming. One thing that these pens have in common with most markers, is that all the colors are about the same intensity – strong. 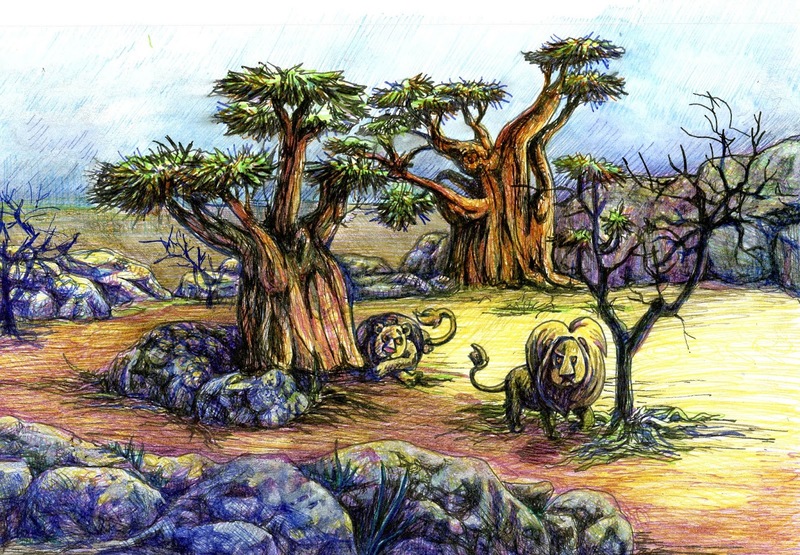 This can provide a challenge, because even with differences in dark and light, a drawing can seem flat if all the colors have the same intensity. The usual method to deal with this is to leave large areas of the page uncolored, and to add layers of color to shade the darkest areas. Most people do this without even thinking about it. There are other methods though, that can increase the the beauty of your drawing. For that reason, while trying out these Fineliners, I specifically tried techniques such as squirkling, mentioned above, and hatching (a series of lines), to allow some of the paper to show through, creating lighter areas. For an even softer look I also tried using water, and a blending pen to spread and lighten the color, as well as using a white ink (specifically formulated not to clog tips) and coloring over it, to see how well I control the values and intensity. Please don’t get the feeling that you have to take all these measures to use these Fineliner. Using them the way you use other markers and pens will give you a beautiful drawing experience. But you can go farther with these than with some of the markers out there, so I thought I’d show you. I had no problems with feathering, bleeding or show-through on this cardstock weight paper. I had no problems with feathering, bleeding or show-through on this marker-formatted paper. I the black Fineliner to draw this as a black and white with full shading first, to see if I could control the intensity that way. It didn’t work as well as I hoped, because I couldn’t get the colors light enough for a good contrast. I used both water and blending pen to soften and lift some of the color. The ink color doesn’t spread far, so you can’t use these pens for watercolor-like effects. In areas, where I had shaded too heavily for the look I wanted, I used white ink to return the area to white, and colored over with the Fineliners. (I can’t caution you enough. If you do use white ink – whether in the form of a gel pen, acrylic marker, liquid ink – make sure it will not clog your pens. Most such inks will ruin markers and pens). I had no problems with feathering, bleeding or show-through on this mixed media paper. 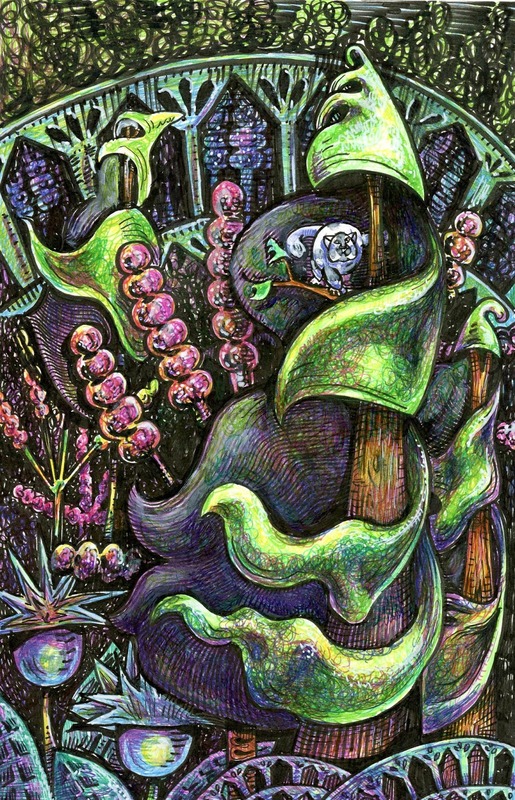 For this drawing, I used hatching as my main way to lighten the intensity of the colors. I did use a little water in the rocks at the front to get a smoother blend. I got my darkest values by applying several layers of darker colors until I reached black. Unfortunately, the Fineliner colors don’t show up on black paper. They do work nicely on gray-toned paper though. I used hatching and squirkling to lighten intensity in some areas. I used more white ink on this than with any of the others, mostly to up the contrast. Kind of defeats working on gray-toned paper in a way, but the gray does give you a natural shading effect this way. 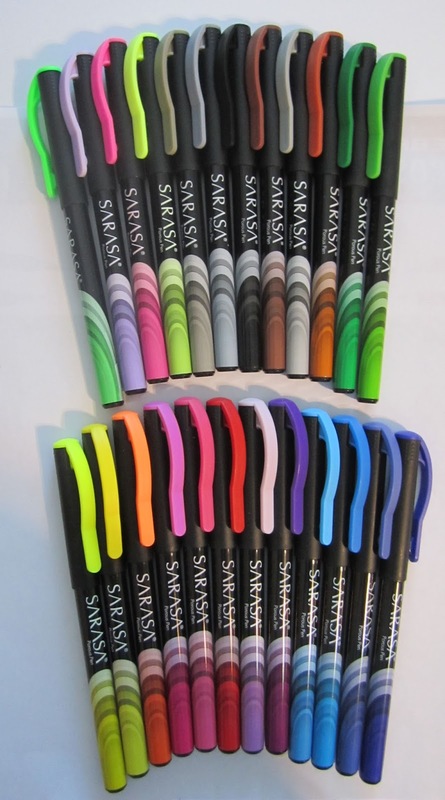 Zebra Sarasa Fineliner pens have features of both marker and pens. 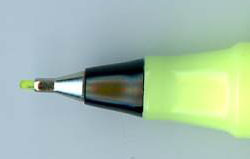 The metal-reinforced fiber tips are small making it possible to write and draw fine lines. It can be a tedious covering large areas, but the ink flows easily which helps. The ink is not water-proof, which means you can spread the color with water, and blending pen to get lighter color. Neither of these will spread the color far however. The ink works well on a variety of papers. 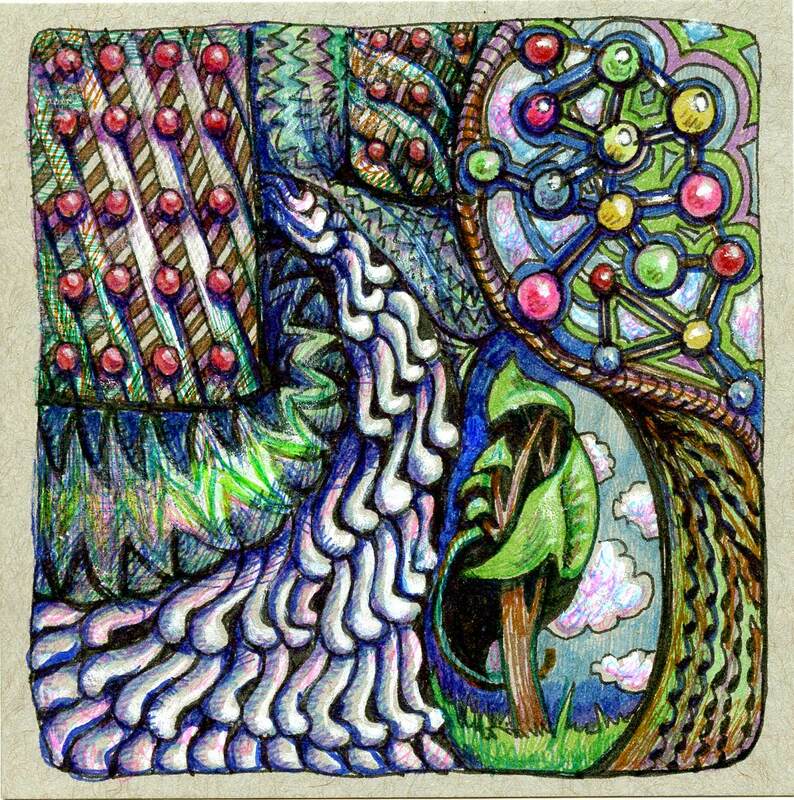 Normal marker-coloring techniques will produce a beautiful piece, but the pens are good enough to use with more advanced techniques as well. ANNOUNCEMENT: Start your drawing now! 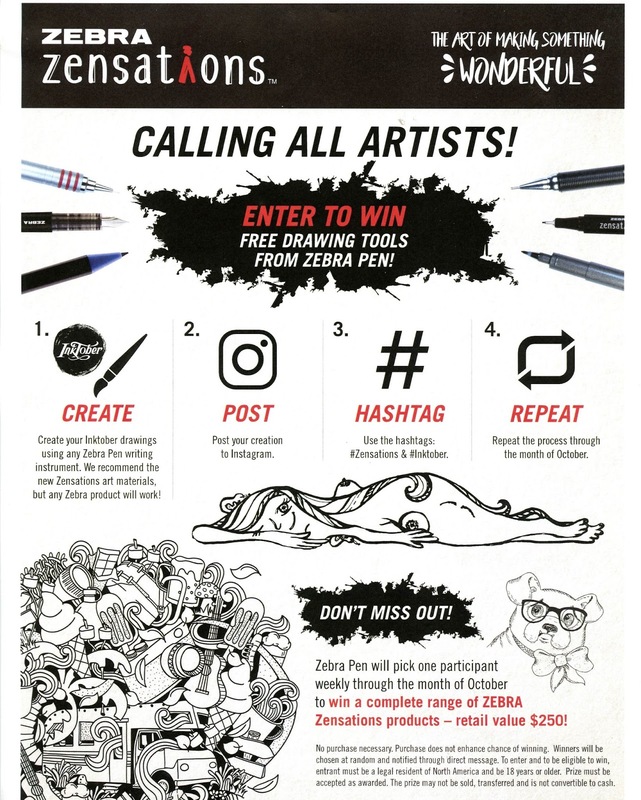 In October, Zebra is having an Inktober celebration and will be giving away a complete range of Zebra Zensations products each week! Create an Inktober drawing using any Zebra Pen writing instrument (Zensations products recommended but any Zebra product will do). You can enter each week. U.S. only and you must be 18 or older to enter. Disclaimer: I am a Zebra Zensations Ambassador which means that I did receive several items from Zebra Pens. However, all opinions expressed in this review are my own. I did not receive any other compensation for writing this review nor was I required to write a review as part of my agreement with Zebra Pens.